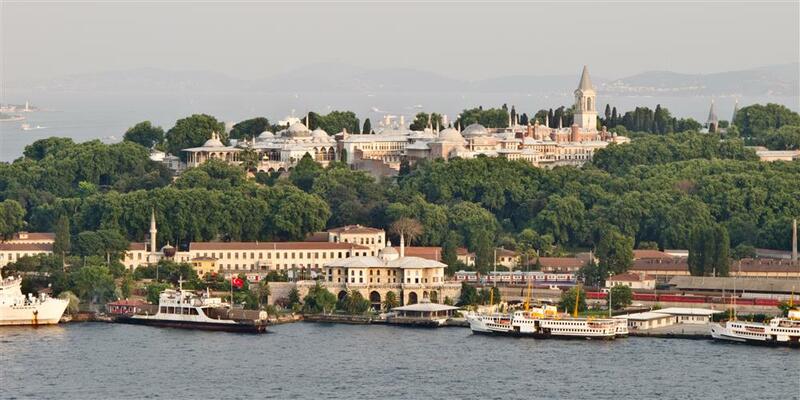 The construction of Topkapı Palace, which is at the top among the places that must be seen in Istanbul, started in 1478 by Sultan Mehmet the Conqueror who took over the city in 1453. Located where the oldest acropolis in Istanbul originally stood, the palace grew gradually by new buildings added by various sultans. It served as the seat of imperial rule and the official residence of Ottoman sultans for 380 years until Sultan Abdulmecit relocated the center of administration to the newly built Dolmabahce Palace. Following the proclamation of the modern Turkish Republic, Topkapı Palace has become a museum and was opened to public visit. Following various restorations, more pavilions of the palace were opened to public visit. With the Holy Islamic Relics displayed in a renovated pavilion, with its unmatched jewellery, weaponry, books, manuscript and garment collections it is the most visited and most popular museum of Istanbul. Hagia Sophia is one of the most visited museums and most prominent monuments in the world in terms of art and the history of architecture. It has also been called “the eighth wonder of the world” by East Roman Philon as far back as the 6th century. The current Hagia Sophia is the third construction, done in a different architectural style, even though it occupies the same location as the previous two. The original building was constructed by the most important architects of the period (527-565), Anthemios (Tralles) and Isidoros (Miletus), under the order of Emperor Justinianos. It was used as a church for 916 years; following the conquest of Istanbul, the Hagia Sophia was converted into and used as a mosque for 482 years. 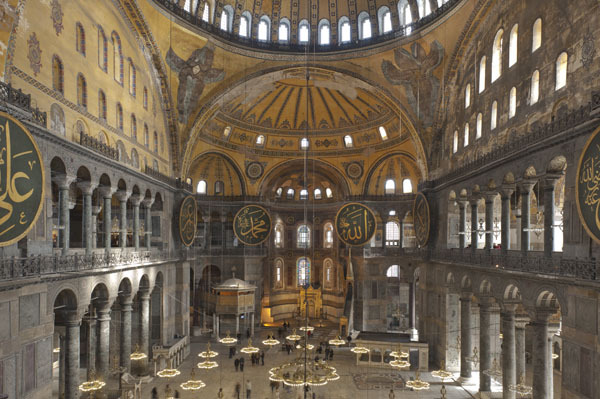 In the Republican period, in 1935, Hagia Sophia was converted into a museum. 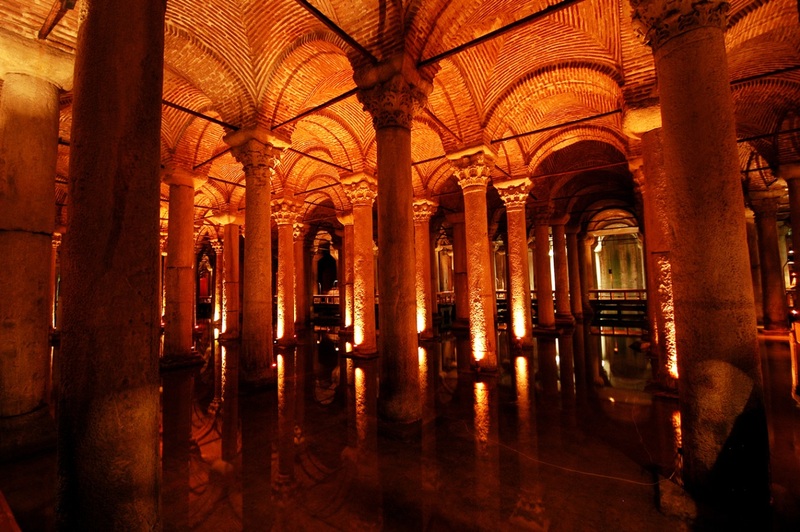 One of the magnificent ancient buildings of İstanbul is the Basilica Cistern located in the southwest of Hagia Sofia. This big underground water reservoir was constructed for Justinianus I, the Byzantium Emperor (527-565). The cistern is 140 m long, and 70 m wide, and covers a rectangular area as a giant structure. Accessible with 52-step staircase, the Cistern shelters 336 columns, each of which is 9 m high. Covering 9,800 sqm area in total, the cistern has an estimated water storage capacity of 100,000 tons. Two Medusa heads, which are used as supports under the two columns at the northwest edge of the cistern, are the great work of art from the Roman period. During the rule of Byzantium, the Basilica Cistern used to meet the water needs and requirements of the great palace that covered a wide area where the emperor resided. After the conquest of Istanbul in 1453, it was used for a little while as the water supply of Topkapı Palace where the sultans resided. Renovated twice during the reign of the Ottoman Empire, the cistern was repaired in 1723 for the first time. And the second repair was done during the rule of Sultan Abdulhamid II (1876-1909). In period of the modern Turkish Republic, the cistern was cleaned by Istanbul Municipality in 1987 and was opened to visit. The Basilica Cistern functions now as a museum.